I had to do Thimbles on Friday as I had to work yesterday and could not go to my usual time. I did get to see most of my buds as they were there on Friday too. I picked up my exchange squares but they came home in the bag. 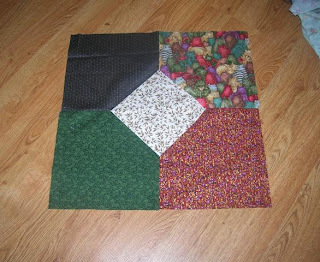 i am not starting yet another project until I finish some of the ones in progress now! Also picked up swap # 4 and that also came home to be started at a later date. I made that cute little lavender block. I found it in a plastic bag when I was cleaning the sewing room. 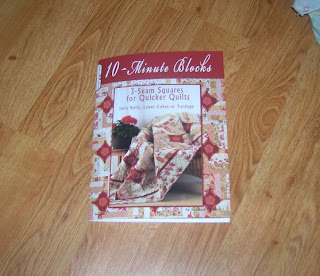 The directions stated it was a $5.00 Saturday block from Sweet Home. Don't remember the year it was offered. Melissa??? Also did a stand and stow for Kris. I have one more of those to finish. Need to get back to the sewing room clean up but the house is clean right now and I hate to mess it up! 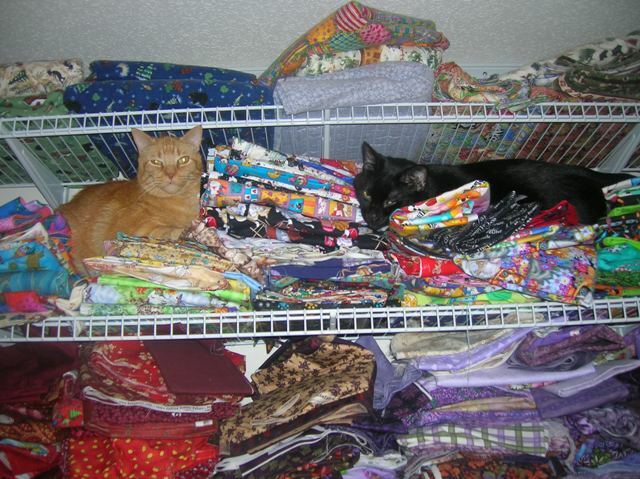 at least the boys have selected the right pile of fabric on which to rest-the cat fabric! Why they feel the need to jump up on the this shelf is beyond me! I made a "to do" list for today. The emission check for the car, so I can get the tag renewed before my birthday, a pedi for feet that need attention and cleaning (the cleaning lady comes on Monday.) I don't clean before she comes but with the fabric explosion in the living room, I need to get a handle on it. so I got up early and knocked off the usual stuff-laundry, etc. I was at the emission station at 8AM. Since the nail salon did not open until 9:30, I headed out to Sweet Home. I had some quilt tops to donate. But now I need to get back to that messy picture on the top of this entry. I think some of this stuff is going to be donated because I just don't feel like dealing with it. 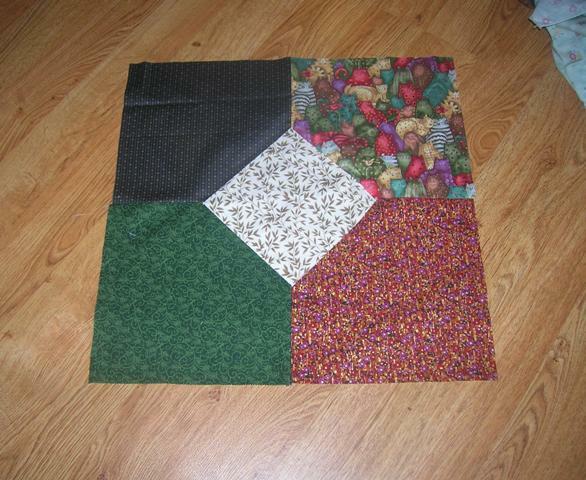 I still have a mountain in the sewing room as well. Where are the fabric fairies when you need them?? Yesterday was Emma's dance recital. Did I remember? Of course not-I really need to write things down and paste them up on the refrig. Fortuantely, Sue called in time for me to drive over to Roswell. So much for the pedi today. I love the tiny dancers-they are so cute. Emma had her routine down pat and did well. I brought the girls back here so Mom and Dad could go out for the evening. We stopped at Mickey Dee's and got our picnic food. Willie has not had any french fries in a very long time! Despite the mountains of fabric being sorted and cut up, Emma found room for the Polly's and Moda Man arrived for some fun times. He has not had any time with the girls in a long time either. Thank goodness for Disney tv. I really need to figure out how to make the DVD work so we can watch movies. Sarah and Emma managed to make some crafts and pick out fabric for laundry bags. They are still sleeping this morning. At any rate, the past few weeks have caused much devastation and many deaths. Joplin, Mo was hit as was Tuscaloosa and Reingold. Judy Laquidara of Patchwork Times blog lives close to Joplin and several days ago proposed a way to help those devastated by the tornado. 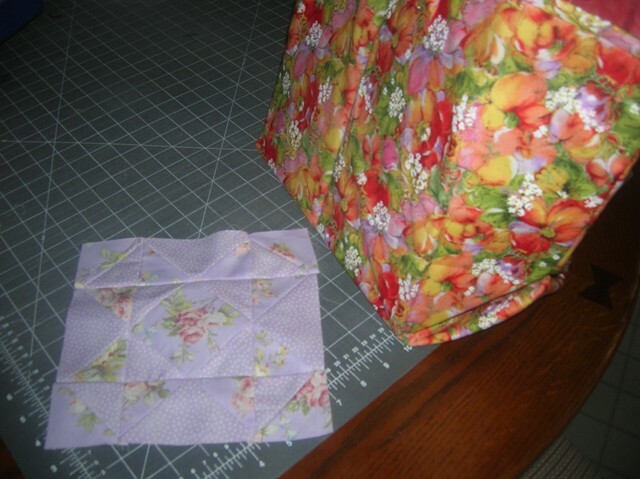 If you sent her a check for the red cross, you would be entered in a drawing for a quilt. I have watched her blog. And the checks have rolled in. The total collected is up to $9520. 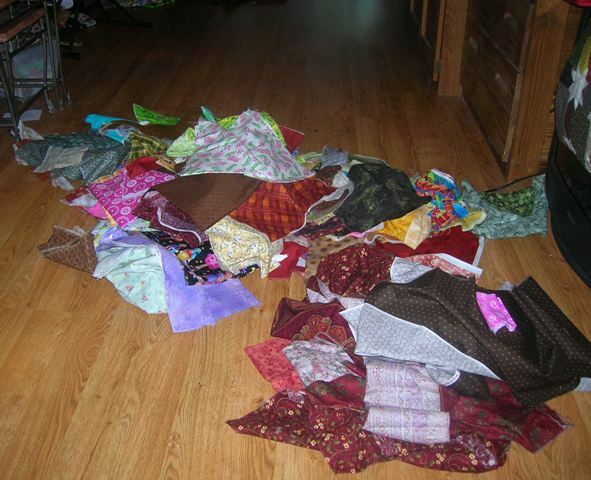 Quilters responding to others in need. Hat off to all who have participated. We open our hearts and pocketbooks and respond to the needs of people we will never know. Charity quilts, quilts of valor, quilts for Japan all those who sew for hospitalized children or people with cancer. Who says the world is a terrible place-there are many of us who really care about others.